I wish John were home for about five million reasons, but the one that's at the forefront of my brain at the moment is quite selfish. I need someone to take pictures of me wearing this apron! It is extremely hard to photograph oneself in general, but this has proven to be quite the task. Unfortunately, it is what it is! I was supposed to post a bathroom overhaul today but there was a change in the schedule (as well as my supplies! 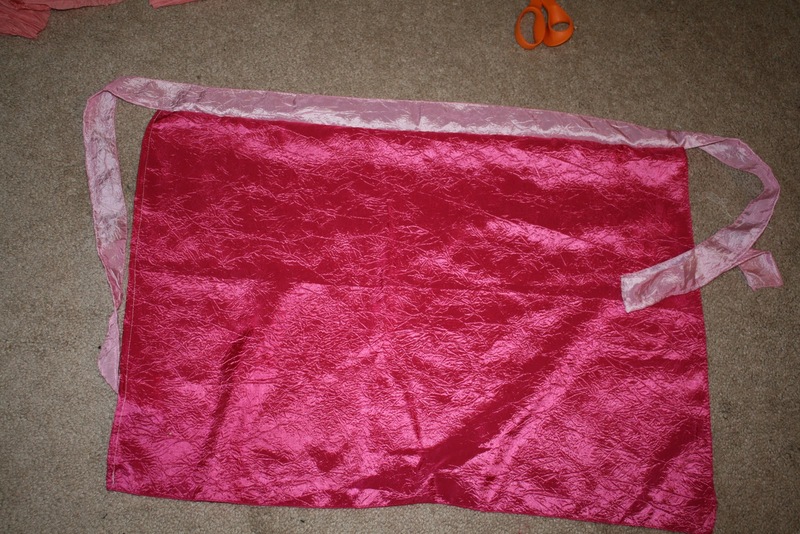 ), so I looked around to see what I *could* make and saw that a ruffle hem apron was definitely possible. The fabric I used was left over from our wedding. 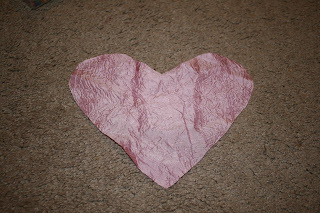 They were once table cloths and I've been repurposing them over and over again since then. 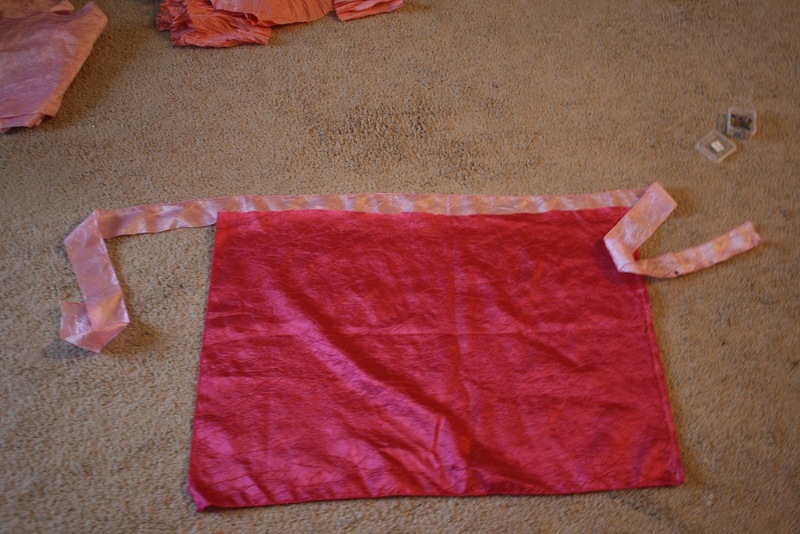 Today, some scraps were used to make a fantastically easy apron, and since the colors were pink and Valentine's Day is right around the corner, I themed the apron as well. Ta da! 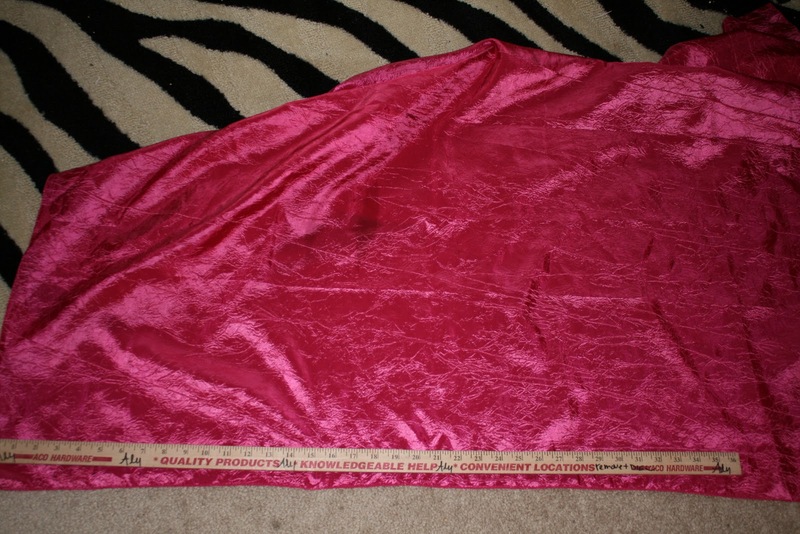 The material is some sort of taffeta, which I don't recommend. 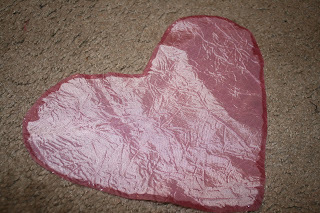 It definitely wasn't easy to sew and the heart pocket needs to be reinforced still, but my needle isn't functioning (more about that later). As long as you use an actual material (lightweight canvas would be fantastic, and I thought of making this out of an old tote...) you will be fine. 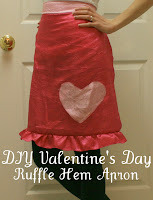 I already have 18 more ideas for cute, easy aprons but none of them had ruffles... and the theme is ruffles, so this look won for today! (1) Measure it. Measure out the size of your apron. 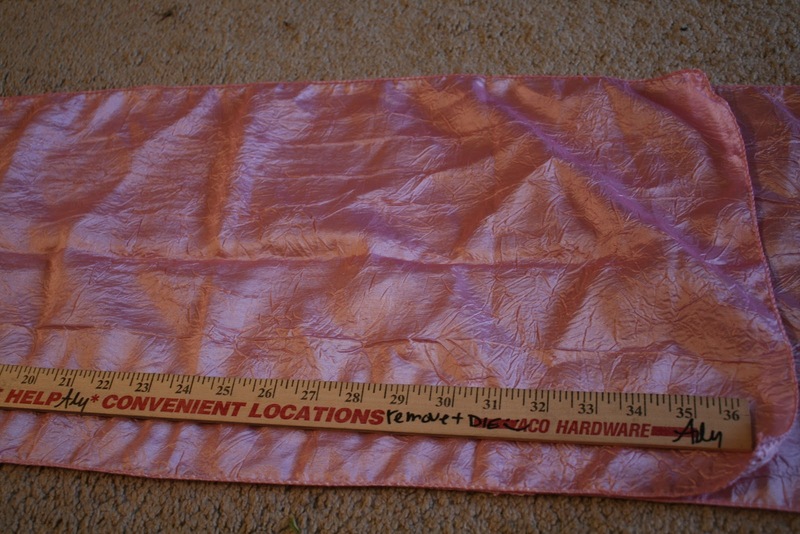 My square of fabric was 28 inches long by 17 inches high, which was perfect. Remember to leave space for seam allowance. 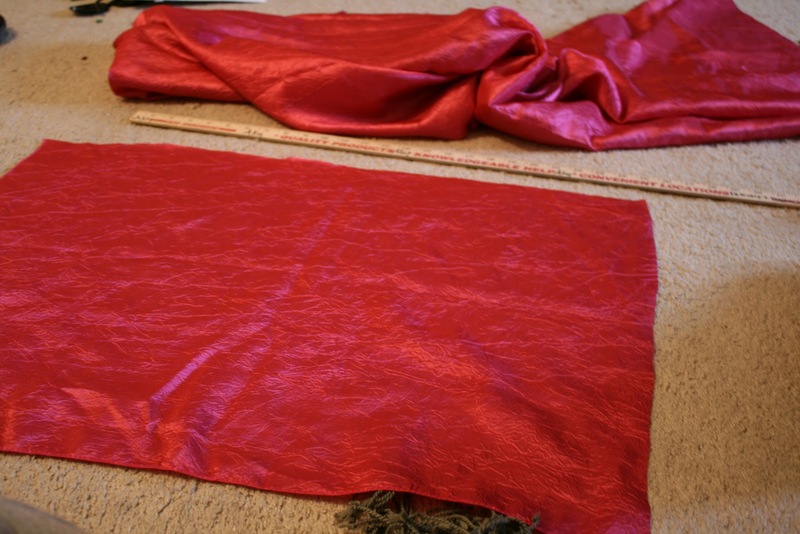 Since I used a table cloth, I cheated and cut from the corner, leaving only two edges for me to hem! Yesssss! (3) Attach it. 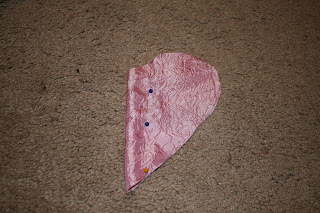 Pin the apron to the apron string. I tried to show you some up close photos of how I did the hem so that you can copy it. I killed two birds with one stone by hemming the bottom of the apron string at the same time as I attached it to the top of the apron. See the photos to do the same thing! Ps- notice the fabric in the background? It's for the next apron... coming soon! 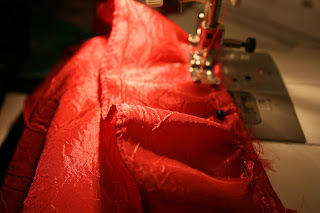 (4) Sew it. Sew down the apron string to the apron. 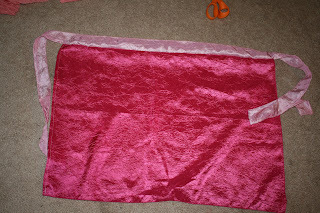 This photo shows the apron after everything has been hemmed and the string has been attached. (5) Heart it. At this point I got lazy, which was a bad idea. I cut a heart out from the same fabric I used as an apron string and then, instead of stitching it, I decided to use Fray Check. Yeah... it stained the fabric. Oops. It dried much better than you see in the photograph, but it still didn't disappear. I used a hot glue gun to attach it at first, but the glue wasn't strong enough for taffeta. 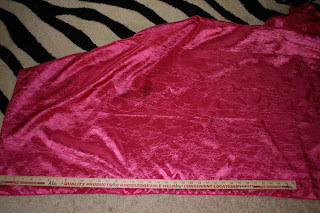 Ahh, taffeta... the world's worst fabric. If you use cotton, you won't have a problem. I ended up having to go over it with my sewing machine (single, titch stitch), but the needle got jacked up trying to move through the glue... sooo it's half done right now. Also, this is supposed to be a pocket, so stop attaching it (via glue OR thread) when you start to round the tops of the heart corners. (6) Ruffle it. 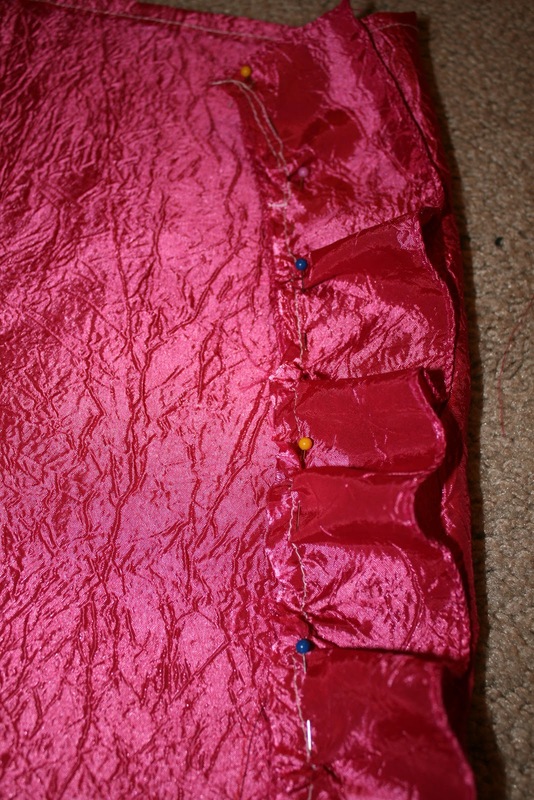 It's time to add the ruffle on the bottom edge. 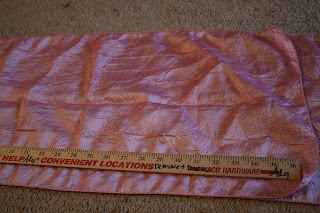 Measure out a piece of fabric about 12-15 inches (depending on how much ruffle you want) longer than the edge of your apron. Cut it out (about 3 inches in height) and gather it. You'll just use a sewing machine (or hand stitch) a straight loose line along the top of the material. 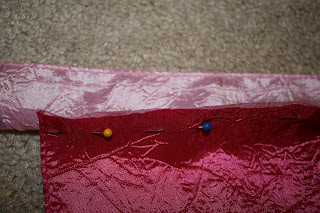 Choose ONE piece of thread from one side and begin to pull on it. As you pull, move the gathered material toward the other end of the fabric until your ruffle is spaced out and the correct length. (7) Finalize it. Pin your ruffle on to the bottom of your apron, remember to pin it so that it looks right when you wear it (you don't want the hem showing!). Next, run it through the sewing machine and you're done! Phew! It always takes me so much longer to write these blogs than to create the projects that are the substance of them. Isn't that interesting? 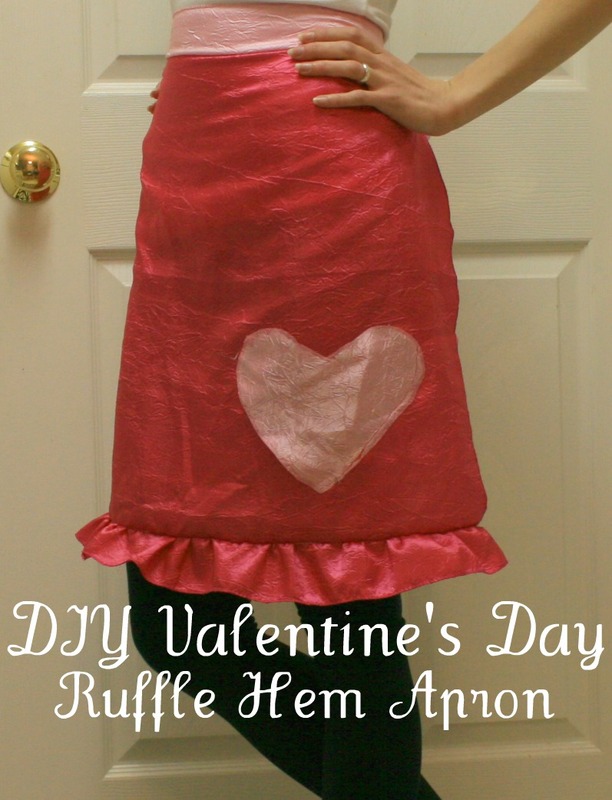 In no time, you will have a little half apron for Valentine's Day. I love half aprons, I think the shape is so flattering and classic. I also enjoy Valentine's Day in theory, and I am SO excited to enjoy it in reality this year. John and I have been together for 5 or 6 Valentine's Days and never gotten to celebrate together. This year we're both scheduled to be home and I couldn't be more excited! Love it!! I'm going to look through my fabric tonight. I love aprons. What a great one to add to my collection. Thank you!